Our performance screens are designed to help clients understand where they can improve and detail the path necessary for improvement. We work with anyone looking to get the most out of their bodies. Our performance screen helps us uncover weak points, areas of fatigue, past injuries, sleep, nutrition, and much more. This information helps us determine the best route for improvement, helping you get to your goals. Many people have tried different trainers and done numerous fitness classes, creating skepticism of these claims. Sometimes other systems provide short-term results, while others provide no improvement. At COR, we take a systematic look at each individual, not just having someone hop on a treadmill! We unlock the underlying problem and provide the solution! You should be skeptical when you hear these claims, as talk is cheap. “Making you better” isn’t only our motto, but our philosophy and to prove this, we offer a no questions asked, full money back guarantee after your screen. We guarantee our method and approach is unlike anything you’ve ever experienced and our assessment will unlock the root cause of your problem and outlines a plan for improvement. If you’re seeking a full personal training appointment, please see our personal training information and schedule accordingly. 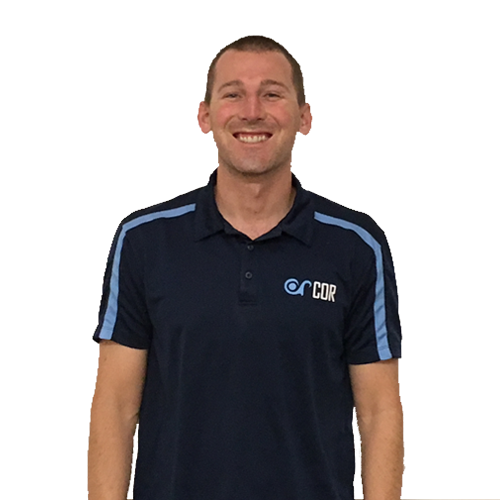 Chris Barber is a foremost expert in sports training, body composition enhancement, and application of biomechanics for performance. 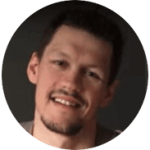 Chris is a Certified Personal Trainer with the National Council of Strength and Fitness (NCSF) and with United States of America WeightLifting (USAW). Chris graduated with a B.S. at Concordia University in Irvine, CA. He writes extensively on health, fitness, and sports, being featured in various sports magazines. 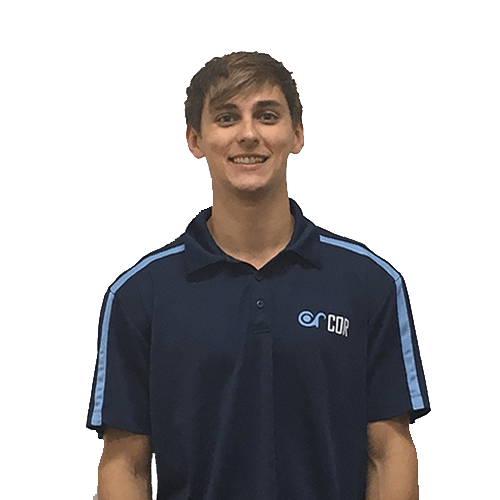 Chris started as an Intern at COR in December of 2012 and has moved his way up to the Director of Personal Training and the Head Strength and Conditioning Coach at COR. Chris has been devoted to helping everyone strive to achieve their goals. Chris is an elite personal training and specializes in weight loss and body composition changes. In 4th grade, when asked what she wanted to be when she grew up Dr. Erin Cameron, DPT, CSCS replied “physical therapist,” a rather unconventional response for a child that age. 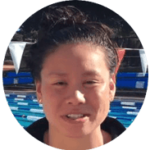 She was a young swimmer with shoulder pain, desperate to return the to sport that she loved so dearly. The dedication of her physical therapist allowed her to pursue her passion and eventually go on to compete at the collegiate level. Dr. John Mullen, DPT, CSCS is a World renowned expert and speaker in sports training and rehabilitation. He received his Doctorate in Physical Therapy at USC, as well as the Josette Antonelli Division Service Scholarship, Order of the Golden Cane, and the Order of Areté. Dr. John has done extensive research on orthopedics and sports and has worked with multiple professional and Olympic athletes, helping them earn Olympic medals. Dr. John has been featured in Gizmodo, Motherboard, and many more. Before his Doctoral program, Dr. John swam on an athletic scholarship at Purdue University, was an Academic Honorable Mention All-American, and was awarded the Red Mackey Award and R. O. Papenguh Award. Dr. John was born in Centerville, Ohio and was a 24-time high school All-American Swimmer. Dr. John is still a swimmer and holds a Masters swimming World and Pacific Swimming Record. Michael Vaandering graduated from the University of Michigan School of Kinesiology with a B.S. in Physical Education and a minor in Health Education. 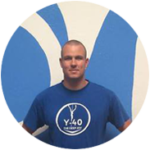 He is a Certified Personal Trainer with the American College of Sports Medicine (ACSM). Michael grew up on the west side of Michigan, where he competed on his high school’s water polo team as well as the swimming and diving team. As a springboard diver, he earned all-state and all-American status. During his junior and senior years, Michael used his experiences on the diving board to informally mentor the middle school diving team, including occasionally taking the role of interim coach. During his college career, he was a member of the University of Michigan Men’s Swimming and Diving Team where he helped his team toward NCAA and BIG 10 Championships. During that time he was also a coach for the local rock climbing team. He used these outlets to apply his knowledge of the underlying biomechanical principles involved in motor movement and performance to gain an edge over competitors and improve the strength and efficiency of his climbers. Michael has also been published in the International Journal of Case Studies as well as the Journal of School Health for his research into the connection between physical activity and cognition. As a supporter of lifelong sports, Michael spends much of his time in such activities as tennis, squash, rock climbing, hiking, and swimming. • Please arrive at your appointment with your paperwork completed. • You will be seen by the coach. • Your current physical limitations and injuries. • Past physical limitations and injuries. • Areas of strengths and weaknesses. • Current nutritional and supplement program. • Mental association with food and nutrition. • How much you sleep and your sleep routine. • Your mental state during training. • Palpation – touching around areas of the pain. • Range of Motion (ROM) – the coach will move the joint(s) to check for the quality of movement and any restrictions. • Muscle Testing – the coach may check for strength and the quality of the muscle contraction. Pain and weakness may be noted. Often the muscle strength is graded. • Special Tests – the coach may perform special tests to confirm/rule out the presence of additional ailments. • Posture Assessment – the positions of joints relative to ideal and each other may be assessed. • Biomechanical Evaluation – the effectiveness and safety of specific exercises may be assessed. Unlike other facilities, we’re comprehensive and obtain a lot of information during this session. This information allows guide you to elite performance. What Should You Bring to Santa Clara Personal Training at COR? • Comfortable clothes. We suggest a t-shirt and shorts. • Paperwork on the first visit. Facility offers complimentary towels and shower services. A no-show or late cancelation fee (less than 24 hours notice before the session) results in a 100% penalty of service ($100 for physical therapy). 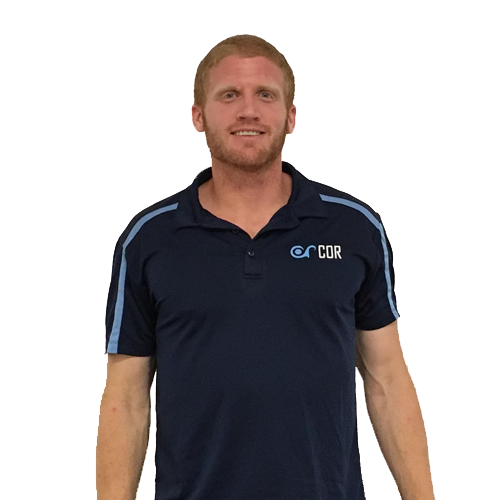 I'd like to thank COR helping me with a shoulder injury I was dealing with for 6 months and I was amazed how quickly my shoulder pain was going away. I've been going to COR for a few months now---started with a Groupon for the boot camp, and now I pay full price for personal training and the boot camp, which is saying something... I do personal training with Chris, who is awesome. And the personal training sessions are only $40 each, which is sort of unprecedentedly low price. He knows a ton about form (he's a professional, after all) and can troubleshoot all your muscular imbalances without you even telling him first. I also take boot camp about 3 days a week with Michael at 6:30pm. Those classes are full-body and really hit both the strength and the cardio. Michael is also really pleasant, and highly skilled as well. COR also has a nice community/team feeling, and everyone works hard, no matter what their fitness level is. Everybody at COR is very professional and knowledgeable in their areas. I usually go to a boot camp with Chris and had some physical therapy sessions with Dr John. My family get personal training and physical therapy as well. I have been a member of boot camp from the very beginning. There are many members like me at COR. You will find not only the best service but also the best community for your mental and physical health. COR is without a doubt one of the best things I have done for myself. I started COR 5 years back and since then I have pushed myself both physically and mentally to limits I could not imagine and I certainly have reaped the rewards. Dr. John, Chris and Mike are amazing, they encourage you every step of the way and they are so passionate in everything they do. With their help I am constantly re-evaluating and re-setting my goals to lose body fat and train harder to do events like Spartan race and half dome hike and marathons. Above all, COR is a community of people who support and encourage each other. It is fun to be part of COR group. Over the years this group have become my best of friends and part of my family.I recommend COR to anyone who wants to take the first step towards fitness or anyone who wants the challenge and push their limits, COR is a perfect place for you, where you are heard and helped by experienced coaches to set goals and successfully do it. COR really knows how the body works and after working with them, I had my best NCAA performances. COR knows how to help World Class athletes feel better quick and efficiently, they are the best in the business. What a great place to work out, an amazing fitness program that has helped me achieve my goals. The trainer Mike is a beast and he is always positive, helping people out when they need it. After undergoing ACL and meniscus reconstruction 7 months ago, my hopes of returning to my previous swimming form were faltering. 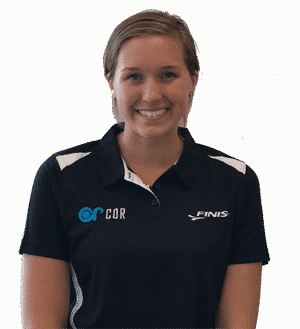 When I first came into COR 3 months post-op, my main source of frustration was the fact that I felt as though my doctor and the other physical therapists I had been seeing had inadequate knowledge of the subtle biomechanics and physical demands of swimming. Whereas they were primarily concerned merely with the return to everyday life and sport, Dr. Mullen shared my goal of coming back even stronger than I was before. 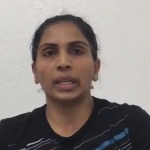 I especially appreciated the fact that he was also able to provide me with insight on ways to improve my performance not directly related to my knee. Overall, I'm glad my knee injury brought me in to see him, because he has really impacted me with lots of new insight on my swimming. Plus, the front desk has made my experience as convenient as possible; they're always very helpful in setting up my appointments via email, which is a huge plus! I had really damaged my left and right knees from years of volleyball playing and skiing. I hired Chris Barber to help me work through my left and right knee pain for the last two years. I worked out twice a week with Chris and also try to do similar exercises on other days. My knees are not 100 percent recovered but now I can jog and ski without injuries. Rather than doing surgery, I would recommend hiring Chris to help you strengthen your knees. Over the past 4 years, I have come to COR to see Dr Mullen for physical therapy and worked with Chris and Mike for personal training. With these 4 years of experiences, I can absolutely say that COR is the best. They are expert at what they do. Everyone at COR is friendly and you always see big smiles the moment you walk into the door. Dr. Mullen treated my shoulder issues and knee/hip injury caused by running. He quickly identified the problematic muscle groups and explained why I was having the pain. He corrected my running posture, gave me routines to warm up and warm down the specific muscles, and assigned simple exercises that focused on strengthening these muscles. I was able to get back to my normal routine quickly and also know how to prevent the injuries from happening again. Currently, my daughter and I have regular personal training sessions with Mike. Mike is full of energy and smile. The workouts are hard but fun. He pushes us to our limit but he always keeps an eye out for the correct form and posture so we are doing the exercises correctly, efficiently, and without risking injury. After the hour is over, we are sweating and tired but feel great. As a bonus, Mike is a climber. There is a thick rope attached to the ceiling and he can teach you to climb. It's yet another way to make the work out fun and interesting. Last but not the least, my daughter attended the COR summer camp a few years ago run by Chris. She always came back tired but had tons of fun. And she was always looking forward to going back the next day. If you are looking for a physical therapist and/or personal trainers, I highly recommend you come to COR. You will not only find that your injuries and training needs are well taken care of, but you will also find some new friends there. Let's start off with saying that I'm a bit bias because the staff at COR makes you feel like family. And it's hard not to love family. Here's the usual breakdown (+1) Dr. Mullen is very knowledgeable and truly cares about his patients and boot camp attendees. It's nice knowing that this is one of the few truly health-centered "gyms" I've been to. It's reassuring that techniques practiced have some scientific method behind them and not just propelled by the latest kale-eating-gluten-hating-raw-organic-money-makers. (+1) COR is friendly to people of any shape and any fitness level. I've met Olympic level-swimmers, fellow college students, and retired housewives who all have something to gain from this quaint gym. (+1) The boot camps are a blast! We do a wide mix of activities ranging from injury prevention to power lifting to cardio to fun workout "games". (+1) The instructors are amazing at fixing technique and monitoring form (health and safety at the CORe of it all!) (-1) Although there are other classes besides bootcamps, I wish there were more time-slots available for each class. It's still a smaller studio so a ramp-up in class availability would be great! Overall, it is a great, loving, and accepting group of athletes (all of us are athletes despite how fast we can go!) that will keep you engaged and motivated. NOTE: This is NOT a gym with ellipticals and treadmills. it is a place where you will sweat, laugh, (maybe cry) but ultimately come out feeling stronger and healthier. I've been training with Dr. John and Chris for almost two months and cannot recommend them highly enough. I can honestly say that I look forward to every session. They make sure I work hard and push myself, but in the best way possible. In addition, they have a wide-range of clients, in terms of age, fitness level, and goals. So, there's no concern about feeling comfortable or out of place. Some things that really make them standout compared to other trainers: 1) They are sticklers about form, which not only makes my workouts more effective but minimizes the likelihood of injury. Dr. John and Chris have the expertise to instruct clients how to do big compound lifts safely, rather than wasting time on lots of machines or too much accessory work. This is not something you will find in a lot of trainers, who either don't know how to teach these lifts or are afraid to do so. 2) They are incredibly organized, providing a spreadsheet of every exercise I will be doing over several weeks, so that we can keep track of my progress. (And I've certainly made substantial progress in a short period of time.) Trust me - this is a rarity. 3) Dr. John did an incredibly thorough evaluation session with me first, which was very helpful in terms of figuring out my strengths/weaknesses and tailoring my training plan. 4) Related to #3, they also really listened to my goals and ensured that my training plan helps me reach those goals. My goals are more strength training and muscle-building focused. And so we concentrate on mostly compound weight movements. But this is not a cookie-cutter plan. I've seen clients doing an incredible variety of types of training - higher rep weight training, endurance training, interval-type work, etc... Basically, COR (and Dr. John and Chris, specifically) has turned out to be everything I could have hoped for from a personal training experience. I've been a part of COR for more than 5 years now. In that time I've been able to get into great shape at boot camp, see Dr. John in PT to help me through a back problem, do one on one personal training with Dr. John, then start training with Coach Chris and a group of friends, and bring 3 other family members into COR for PT with Dr. John and Dr. Erin. COR has become like family. I wouldn't go anywhere else for a physical therapist or physical trainer! By far the best of physical therapy and personal training. I couldn't be happier with my results.